We see so many images of the wedding rings sitting on the wedding bouquet or on the shoes or some other inanimate object that they are start to look the same after awhile. It occurred to me that maybe we could do something a little different while shooting the wedding portraits that would give the rings a little more of a connection to the bride on her wedding day. 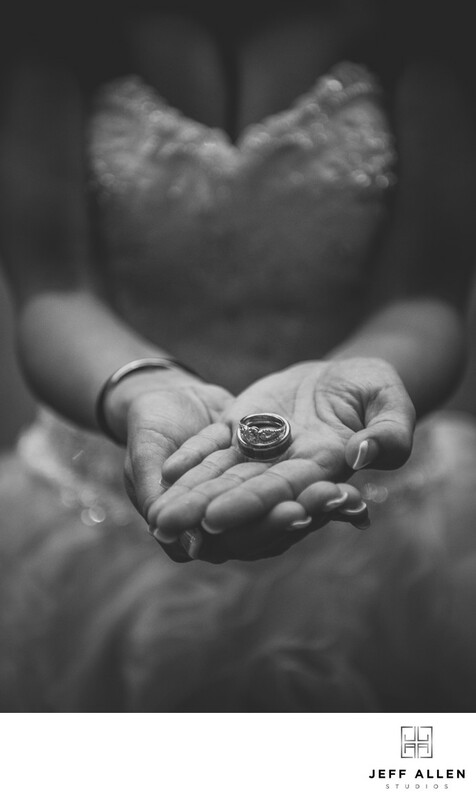 When I first started shooting weddings I really loved shooting details especially the rings. As the years went on I fell out of sorts when it came to photographing them and I wasn't sure why. It finally occured to me one day that it was because we spend the rest of the day trying to capture images of emotion and connection and here are a bunch of items that are extreemly precious to the couple yet they aren't even in the images. This was the day I tried to change all of that. I was really happy how this turned out highlighting just the rings and the bride's hands holding them, presenting them to the viewer. Once the image was converted to black and white and some additional editing to the print it really came to life and created the image we have here. It's important as photographers that we remember to always look for different way to capture a moment to make each image unique and not to become complacent in shooting the same photos over and over again. That's one of the ways we really strive to create captivating wedding photography images for our couples here at Jeff Allen Studios. Location: 130 N Front St Wilmington, NC 28401. Keywords: B&W (3), BRIDAL PORTRAIT (3), D810 (9), DETAILS (6), Jeff Allen Studios (72), NC (24), Nikon (12), RINGS (6), WEDDING PORTRAIT (3), WEDDING RINGS (3), WILMINGTON (3). 1/80; f/2.8; ISO 2500; 70MM.